There was nothing simple about selecting the No.1 lahmacun maker in Istanbul. There are scores of freshly fired crispy/chewy, spicy/piquant versions of the dish all over town. But, perhaps by sheer coincidence, our top two lahmacun joints are located a stone’s throw from each other in the Asian side’s Kadıköy district, which at least gave us the chance to line them up for a side-by-side comparison of lahmacun-ness. We started the sampling at Halil Lahmacun – an old favorite and a celebrated destination for Istanbul lahmacun lovers. In 1980, Urfa native Halil Dortok turned his back on a promising career as a tailor to open a small shop with an oven where he started making lahmacun. Perhaps it was a tailor’s attention to detail, but Halil’s oven-baked creations quickly won him fame in the lahmacun world. Today Halil’s son Fuat is in charge of the oven and, judging by the traffic in the shop on a Wednesday well before lunchtime, nobody is complaining. 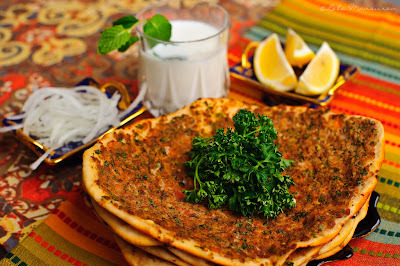 Lahmacun, like pizza, is one of those mysterious foods where a lot is created with so little. But in the hands of a real master, or usta, a paper-thin round of dough topped with a simple mix of ground peppers, meat and spices, becomes something magical – almost a living thing. Fuat pulled two lahmacun from the oven for us – the perfectly round edges just slightly charred from sitting on the floor of the brick oven – and garnished them with a bit of parsley and a lemon wedge on the side. Mama Mia! This looked like a perfect lahmacun. From there it was on to our next taste-ination. We are usually suspicious of chains, particularly when it comes to something as handcrafted as lahmacun. But in the past, we’ve enjoyed many a lahmacun at the Kadıköy fish market location of Borsam Taş Fırın, an Istanbul mini-chain of lahmacun ovens. When we set out to find the No.1 lahmacun in Istanbul, we were intrigued by a few tips that urged us to head toward another branch of Borsam, just a few streets north of the market. Preference of one branch over another of the same chain must indicate the presence of an outstanding usta, we thought to ourselves. Still quite impressed by Halil and ready to walk off a full lunch at Ciya, we headed uphill to find Borsam Taş Fırın in full swing.